"I was looking for a boat that could take me safely around the world. My requirements were quite simple: about 40', comfortable, giving good performance to windward and in light air, strong enough for around-the-world cruising, and interior layout suitable for two people, and built to the highest specs." 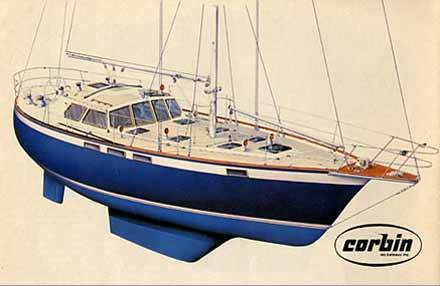 One hundred and ninety nine Corbins were built by Corbin Les Batueix in Napersville, Quebec between 1979 and 1986. They were hand laid up with a traditional matte/roving matrix set in polyester resin, surrounding an Airex core. Of these boats, only 12 were factory finished. The hulls could be purchased at any state of completion for owner finishing. As one broker described them, "Corbins are like a box of chocolates, you never know what you're going get until you open it up." To contact other Corbin owners go to the Corbin Owners Group.